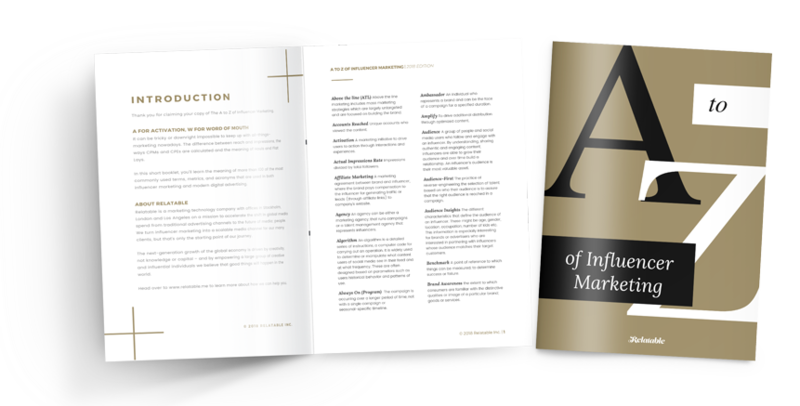 "...100+ of the most frequently used terms, metrics and acronyms that are used in both influencer marketing and modern digital advertising... All in one short booklet!" Bookmark this page for easy access if you prefer the online version. You can download the free PDF here. Above the line marketing includes mass marketing strategies which are largely untargeted and are focused on building the brand. Accounts Reached Unique accounts who viewed the content. Activation A marketing initiative to drive users to action through interactions and experiences. Actual Impressions Rate Impressions divided by total followers. Affiliate Marketing A marketing agreement between brand and influencer, where the brand pays compensation to the influencer for generating traffic or leads (through affiliate links) to company’s website. Agency An agency can be either a marketing agency, that runs campaigns or a talent management agency that represents influencers. Algorithm An algorithm is a detailed series of instructions, a computer code for carrying out an operation. It is widely used to determine or manipulate what content users of social media see in their feed and at what frequency. These are often designed based on parameters such as users historical behavior and patterns of use. Always On (Program) The campaign is occurring over a longer period of time, not with a single campaign or seasonal-specific timeline. Ambassador An individual who represents a brand and can be the face of a campaign for a specified duration. Amplify To drive additional distribution through optimized content. Audience A group of people and social media users who follow and engage with an influencer. By understanding, sharing authentic and engaging content, influencers are able to grow their audience and over time build a relationship. An influencer’s audience is their most valuable asset. Audience-First The practice of reverse-engineering the selection of talent based on who their audience is to assure that the right audience is reached in a campaign. Audience Insights The different characteristics that define the audience of an influencer. These might be age, gender, location, occupation, number of kids etc. This information is especially interesting for brands or advertisers who are interested in partnering with influencers whose audience matches their target customers. Benchmark A point of reference to which things can be measured, to determine success or failure. Brand Awareness the extent to which consumers are familiar with the distinctive qualities or image of a particular brand; goods or services. Brief A written document provided to the influencer to clarify the context and requirements of the collaboration with a brand. Business to Business (B2B) A business that makes commercial transactions with another business. Business to Consumer (B2C) A business who provides its services and products to general people. Call to action (CTA) A call to action is a message that aims to persuade the visitor (viewer, audience member, user) to pursue a certain action. Common examples of influencer CTA’s are “like and comment” or “swipe up”. The intention is to improve the response rate of the post. Campaign The tactical execution of a particular marketing strategy. Caption The piece of text included in a post, that describes it. Each social platform has different types of caption parameters: Twitter for example allows up to 280 characters, while Instagrams limit is at 2,200. Click through rate (CTR) The ratio of users who click on a certain link to the number of total users who visit the page, post or advertisement. Influencer’s who generate high click through rates usually have highly engaged audiences who take action on the content. Collaboration The relationship between a brand and an influencer. The influencer produces content for the brand in exchange for compensation. Content Approval The content produced by the influencers must first be approved by the brand or their partner. Consideration the extent to which consumers consider your brand for a given purchase occasion. Content Calendar A tool to plan content. Content Marketing The strategy of consistently producing high-quality content to engage one’s audience. Conversion The proportion of people viewing an advertisement and ending up making a purchase through the URL associated with the content. Conversion is measured by influencers using tracking links or promo codes. Cost-per-Acquisition (CPA) The metric that measures the cost of acquiring a customer or new user. Calculated by dividing the total media investment by number of acquisitions. E.g. $100,000 media budget / 1,000 sales = $100 Cost-Per-Acquisition. Cost-per-click (CPC) The metric that measures the cost of one customer clicking on a advertisement or link and landing on the company’s website. E.g. $100,000 media budget / 100,000 clicks = $1.00 Cost-Per-Click. Cost-per-Engagement (CPE) The cost that is associated with each engagement or interaction, such as a like or comment. The cost per engagement is calculated by dividing the cost of the specific content by the total engagements it generates. E.g. $100,000 media budget / 200,000 engagements = $0.50 Cost-Per-Engagement. Cost-per-Mille (CPM) or Cost-per-Thousand (CPT) refers to the cost per one thousand units. The unit is typically followers, video views, impressions or Gross Reach. Creative Brief A set of ideas that provides direction for content creation. Creative briefs guide influencers to ensure their content meets the brand’s standards and is able to generate optimum engagement. Collaboration In influencer marketing, collaboration takes place when an influencer and a brand work together. Deliverables The expected results to be produced by the influencers. Disclosure A visible indicator, such as a written text that is required to clearly state the purpose of the collaboration, the connection between the influencer and the brand. Common indications include words or hashtags such as ad, paid, in collaboration with or sponsored. Distribution Channel The platform that is used to share content on. Earned Media The additional organic distribution generated from the media spend allocated to your marketing campaign. Earned Media Value The value of the additional organic distribution generated from your campaign with the assumption of a linear media distribution cost. Not to be confused with ROI. eCommerce The commercial transactions that are conducted electronically. The buying and selling of good or services, primarily on the Internet. Engagement a term used in social media and influencer marketing to describe the practice of interacting with content. Engagement Rate A proxy and key metric to determine the quality of an influencers content based on the number of interactions the content generates. The formula is generally total engagement divided by total Gross Reach or Follower Count. Exclusivity A specific right or restriction a brand or an agency might enact during the collaboration with an influencer. Flat Lay A photograph, usually taken directly from above to showcase a group of items laid out on a flat surface in a stylish way. Feed The platform interface where users view the content that is published by the people and influencers that they follow. Follower Range The term to describe influencers based on how many followers they have. For example influencers can be categorized in micro- and macro-influencers. Influencer costs are usually based on their follow range. Full Commercial Content Usage The negotiated and secured terms to the right to use influencer generated content. This means that you have the right to use the content across your channels, but you do not own the content. Guest Post When a website invites another writer to publish content on their website. IGTV A standalone vertical video application launched by Instagram. Unlike Instagram, it allows users to upload videos of up to an hour and each user page are named "channels". Impressions The number of times a specific content is exposed to an audience. Influencer A creative person or group that has the ability to influence the behaviour or opinions of others: The influencer is the individual who may have an effect on the purchase decision in some significant or authoritative way. Influencer Endorsement The approval for a brand’s product or service, integrated into influencers content in a way that generates awareness for the brand. Influencer Marketing The practice of connecting influential individuals with the right target audience with relevant brands to help the brand communicate their message to achieve their marketing objective. Influencer Marketing Platform A tool that helps influencers and brands manage the influencer marketing process. Influencer Rate Card An outline of an influencer's service costs, which generally reflects the cost of content integrations and sponsored posts. Influencer Representation Influencers who have agents to help them represent their business interest. Many influencers have management teams and agents (likely to that of celebrities) who manage them with collaborations, deals and contracts with brands and agencies. Instagram Business Account The type of Instagram account that provides business with deeper insights of audience behavior and features that allows customers to connect with the business more easily. In order to set up a business account on Instagram, you must connect your Instagram account to a Facebook page. Instagram Bots Computer software programmed to perform actions such as likes, comments and follows of other accounts. Instagram Stories An Instagram feature that allows users to upload a picture or a video on their profile. The content expires after 24 hours, unless highlighted on the account profile page. Instagram Takeover When an influencer takes responsibility for a brand's Instagram account for a short period of time, to share content with the brand’s audience from their perspective. Integrated When a piece of content is referencing to multiple brands. This type of reference is mostly used on Youtube. For example an integrated video post, such as an haul mention multiple brands, whereas a dedicated video only mentions a single brand. Interaction Rate Likes and comments divided by impressions. See Engagement Rate. Key Performance Indicator (KPI) The trackable and quantifiable metric that is used to evaluate the goals of a project. This helps to measure the success and need for activation. Licensing Acquiring the right to use influencer content based on permissions or usage rights. The process varies in based on the specific permissions a brand requests. Link in bio A phrase and call to action (CTA) influencer’s use mostly on Instagram to signal to their audience that they have put more information in their bio. Macro-influencer An influencer with a larger following on one or several of their active platforms. On Instagram a macro-influencer usually haves 100,000 followers or more. Multi Channel Network (MCN) a company or entity that works with multiple channels and content creators, consulting or assisting towards success on streaming video platforms such as YouTube. Media Kit The digital document, similar to a CV that influencer use when reaching out to brands for collaboration. It contains information about the influencer, previous experience, skills, channels and followers. Media Spend The budget invested in a campaign or a marketing initiative. Will typically exclude other costs. Micro-Influencer An influencer with a smaller but usually a highly engaged audience (typically 10-100K followers). Millennials Millennials are the demographic cohort of individuals born between 1980’s and 1990’s, who have reached young adulthood in the 21st century. Most Valuable Distribution (MVD) A term used to describe a brands most effective channel strategy and the best practice unique for their brand yielding the greatest return on investment with the lowest effort or energy. Monetize The process of converting services or assets into a stream of revenue. For influencers, monetization happens when they are able to earn money from created content their social media accounts or blogs. This is often by sponsored content or affiliate revenue. Multi-tied Approach The activation that strategically leverages various influencers across different audience sizes to ensure all key performance indicators are addressed and high-level brand goals are met. Niche A small segment in the market of population with unique or very specific characteristics or needs. Off Brand When content lacks alignment to the value a brand is aiming to achieve. Organic vs. Paid The two types of influencer content: non-sponsored and sponsored. Organic content is non-sponsored and holds no material connection to a brand. Paid content, or sponsored content, on the contrary is driven in some capacity by a sponsoring brand advertiser. Optimize To make the best or most effective use. In influencer marketing optimization refers to making the content perform better. Organic In influencer marketing, something happens organically when there is interaction without the intervention of payments. Outreach To reach out to influencers for collaborations. Owned Media Branded content published on a one’s own channels. Page Views The metric used to show how many views a page on a website got during a specified period of time. Paid Media Any media coverage that has been paid for. Paid Post A blog or social media post that has been paid for to be produced. Often paid posts are produced by influencers in collaboration with a brand in exchange for a form of compensation, monetary or other. Paid Reach Impression that have been earned through a paid model. ROI is often measured by comparing the organic reach and the paid reach. Personal Brand The personal features, values, and qualities of an influencer. Influencers are mindful to make sure that potential brand partners aligns with or compliment their own personal brand, to ensure authentic content to their audiences. Plandid A photo that’s meant to look candid and casual, but is actually strategically planned out. Platform A social media channel or website where users post content. Platforms include: Instagram, Twitter, YouTube, Snapchat, Music.ly, Facebook and blogs. Poll Interaction Rate The share of an audience interacting with the Vote feature in Instagram Stories. Votes divided by views. Product Integration Integration of a brand’s specific product through explicitly introducing, including, and mentioning, it within influencers content. Public Relations The strategic professional communications process, that specializes in a favourable media coverage of a brand or personality. Qualify When evaluating influencers for a specific campaign, some brands may have some prerequisites so a qualification process has to be done. Reach The total number of followers an influencer or a brand has. This may be on a specific social platform or on all of the social platform that are active. Reaction Video Reaction videos are videos in which people react to events or other videos. Return on Investment (ROI) The total value received on a marketing investment. Sampling Goods or services are provided as a form payment for the influencer in a collaboration. Segment A specific group of influencers differentiated by the type of content they create, or by the specific audience demographics they reach. Examples: Lifestyle, fashion, parenting, travel etc. Sentiment The opinions expressed by followers. Sentiment Analysis Computational process to identify opinions expressed by followers within the comments in response to influencer content. This helps to determine attitudes towards a particular topic or product. Social Media The collective of online communication channels, that enable users to create and share content and to participate in social networking. Sticker Taps Sticker taps # divided by views. Swipe up The feature on both Instagram Stories and Snapchat that allows the user to link to a website from their post, so that their audience can get more specific information. The user need to swipe up on the screen to land on the website. Tag Typically a @tag on a post to link to another user’s page on the platform. Target Audience The ideal group of consumers that a brand wants to attract with a marketing campaign. Terms of Service (TOS) The terms or rules that have to be agreed upon before using a product or a service. Through the Line (TTL) 360-degree advertising where campaigns are developed with the vision of brand building as well as conversion. Total Accounts Reached Total unique accounts that viewed the content. Total Content Engagement The sum of all shares, likes, and comments. Total content engagement works as an input for the Engagement Rate, a key metric that is a proxy for the quality of content based on the number of interactions. Total Digital Audience The total sum of an influencer's potential reach across all his or hers active social platforms, including Facebook, Twitter, Instagram, Pinterest, YouTube, Tumblr, Snapchat, Musical.ly, and Blog monthly unique visits. Tracking Links URLs that are used to direct traffic to a landing page from somewhere other than your own website. Tracking links are included in marketing campaigns to help brands track, measure and report the success of an influencer marketing campaign. Unboxing A specific type of video content that depicts an influencer opening, reacting to, and using various products. It implies, a brand sending a package of products while the video shows the influencer unboxing the contents. In a haul video, the influencers have purchased the products themselves and shares the reviews of the items they bought. User Experience (UX) The overall feeling and experience of a person using a product or a service. User-Generated Content (UGC) Any form of content created and shared organically by customers or users. An influencer marketing campaign may aim to encourage fans and customers of the brand to share content of the brand. User-Interface (UI) The interactions between the user and the technology of a website, product or software. Unique Visitor (UI) The term used to measure the performance of a website, that is the number of distinct individuals requesting pages from a website during a given period of time. Views The number of users who have watched a piece of content. View-through People who have completed story clip views minus navigation ”back” divided by views. Word-of-Mouth (WoM) The marketing strategy that relies on satisfied customers sharing opinions and experiences of products and services through oral or written communication with their personal community.